This adorable angel will put a smile on your face. 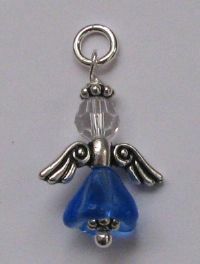 Lead-free pewter wings, Swarovski crystal head, 3-D blue glass "gown" with pink accents, sterling silver halo and findings. Turn this basic charm into a handbag charm, cell phone charm, car rearview mirror charm, or key charm by selecting a keychain option in the drop down box below. Select the Sterling Lobster Claw to make this charm easily hook onto and off of bracelets or zippers.